Incense was burning at the front of the stage while two sharp green laser rays cut through the thick fog, pulsating along the sinister, industrial purring of “If I had a Heart” that preceded Fever Ray’s arrival, last Thursday at Shepherds Bush Empire. 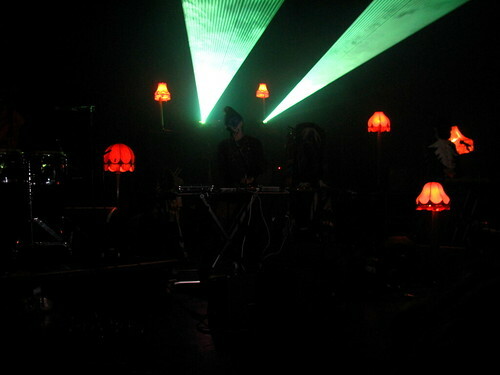 The electronic festivities perfectly blend with the odd decoration on stage — vintage lampshades imported from your Swedish grandparents’ living room — and the grotesque, mysterious costumes worn by the band members. And how often do you see a woman playing the congas at an electronic concert? 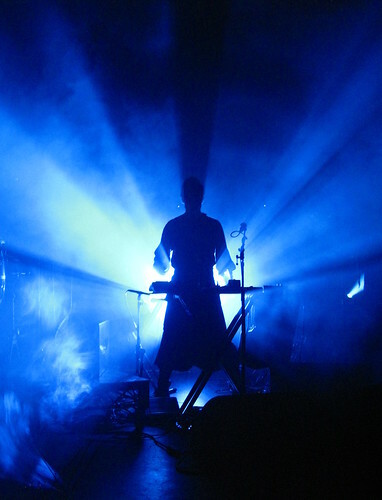 I was really going to write a review for this fantastically surreal gig, but the Guardian’s review simply says exactly what I had in mind, conjuring such appropriately evocative images as “a pagan ceremony with lasers”. Her live band are only dimly visible, their faces painted or masked. They are equipped with keyboards and computers, rattles and shamanistic paraphernalia. In their midst is a strange, heavily cloaked figure which may be Andersson or may not – we cannot say for sure until this great cloth chrysalis releases a slender woman with long blond hair. 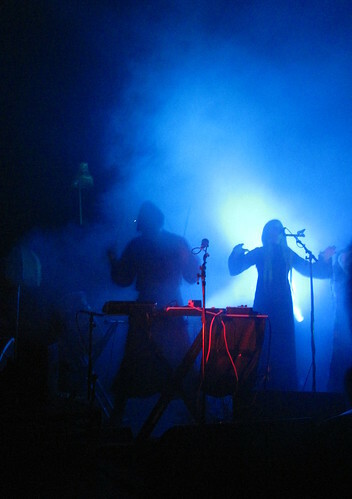 Untreated, as on the haunting “Keep the Streets Empty For Me”, Andersson’s voice evokes a demonic Björk; processed, it can become disconcertingly masculine, and part of the effect of seeing Fever Ray live lies in the disjunct between Andersson’s appearance and the ungodly sounds she produces. See the full Flickr set for this gig.